The Montana Council of the Boy Scouts of America had its Council Camporee over the previous weekend in Townsend, MT. The Scouts have a Camporee like this every four years. 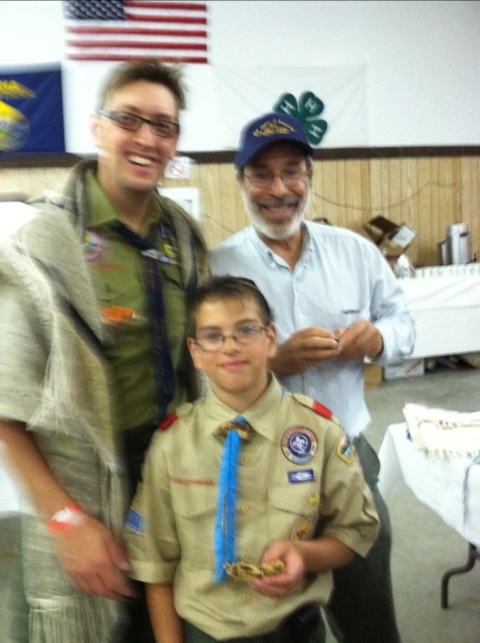 In 2007, Montana Scouts had their first-ever Scout Shabbat at the Council Camporee in Townsend, led by our own Aaron Weissman. This year, Bozeman-based Beth Shalom rabbi Ed Stafman came to the Camporee to lead Shabbos Services. The Service was well attended by interested Scouts and Scouters. The service was sponsored by the Montana Council’s Jewish Committee on Scouting, which is chaired by Great Falls resident (and Aitz Chaim congregant) Diane Sherick. More information on the National Jewish Committee on Scouting can be found at jewishscouting.org. Posted on June 18, 2011, in Events, July, 2011, News of our Congregants, Ram's Horn. Bookmark the permalink. 1 Comment. A little blurry Aaron. Glad you are having fun!